What's New with Bruce Irving Music? 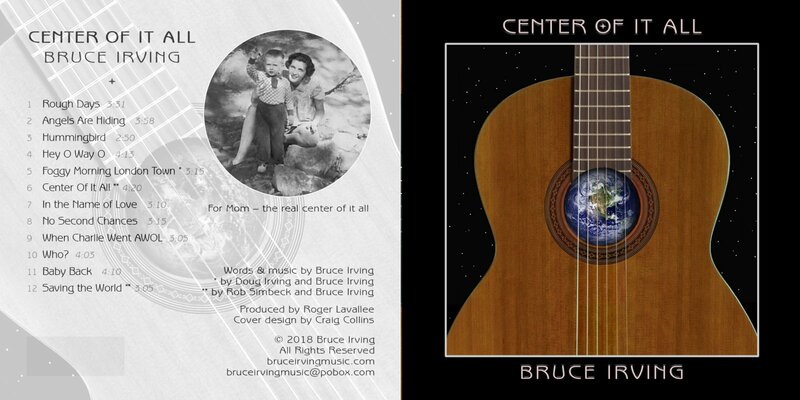 It's taken six years, but in May 2018, I finally finished my new album, "Center Of It All," dedicated to my late mother, the true center of it all for me and my family (miss you, Mom!). I had a lot of help from my friends on this long project. I wrote the title track with Rob Simbeck​, the album was produced by Roger Lavallee​, and Craig Collins did the graphical design. So it's really true, as we learned at Carnegie-Mellon many years ago (or maybe that was kindergarten), that "friends help." There's also a co-write with my brother Doug Irving​. Thanks everyone! The album "dropped" (as my daughter​ loves to say) on June 3 It's on CD Baby and it will soon be available on iTunes, Amazon, Spotify, and other digital sites. Hummingbird -- This was written for Stella's second birthday (video). Animals Are So Cute -- It's not on the new album, but Stella loves the zoo, so I wrote this song about some of her favorite animal friends. Video is here. The Songs on "Center Of It All"
The beautiful album graphics were designed by my friend Craig Collins.